The 2016 Nobel Prize in Physiology or Medicine was awarded to Dr. Yoshinori Ohsumi “for his discoveries of mechanisms for autophagy”. Genetic resources for autophagy study are available. Looking forward to receiving your request. Fluorescent protein-based Ca2+ sensors, which are composed with calmodulin, fluorescent protein and M13 peptide (CaM binding domain of myosin light chain kinase), are designated to visualize intracellular [Ca2+] dynamics. Various improvements of the Ca2+ sensors have been made for optimum temperature, signal/noise ratio, susceptibility and so on. Many papers using Ca2+ sensors have been published reporting the estimation of calcium concentration. Initiation of integrin signaling by cell adhesion to an extracellular matrix (ECM) results in a transient and relatively weak activation ERK while initiation of receptor tyrosine kinase signaling by strongly mitogenic concentrations of growth factors (GF) results in a strong, transient ERK signal sufficient to induce p21cip1. The sustained ERK signal associated with the induction of cyclin D1 arises from a cooperative effect between receptor tyrosine kinases and integrins. Ets-1 or PEA-3 activates the MMP (matrix metalloproteinase) promoters in cooperation with AP1 (c-Fos/c-Jun) on the RRE (Ras-response element). TCF (Elk-1, Sap-1, Net) activates the c-fos promoter in cooperation with SRF (serum response factor). PU.1 activates myeloid-specific promoters in cooperation with AML1 and C/EBP. Fli-1 activates megakaryocyte-specific promoters in cooperation with GATA-1. PU.1 activates the immunoglobulin (Ig) heavy (H) chain enhancer in cooperation with E12, Ets-1, TFE3 and Oct-2. Ets-1 activates the T cell receptor (TCR) a enhancer in cooperation with CREB/ATF, TCF-1, AML1 and GATA-3. DNA damaging agent activates the kinases named Atm and Atr that phosphorylate chk1 and chk2. The phosphorylation of p53 on ser20 by chks induces p53 stabilization by inhibiting MDM2 binding. p21induced by p53 binds to Cyclin E/cdk2 complex to make it inactive form.Chks also help ubiquitination and degradation of CDC25A that is required for activation of Cyclin E/cdk2 complex. Somatic cell cycles consist of alternating DNA synthetic (S) and mitotic (M) phases, separated by gap phases (G1 and G2). Mammalian cells respond to extracellular mitogens and antiproliferative cytokines from the time that they exit mitosis (vertical arrow at top) until they reach the restriction point, after which they can complete the cell division cycle in the absence of extracellular growth factors. Cyclin D-dependent kinases accumulate in response to mitogenic signals and initiate the phosphorylation of Rb, a process that is completed by cyclin E-cdk2. Once cells enter S phase, cyclin E is degraded and cyclin A enters into complexes with cdk2. INK4 proteins oppose the activities of the various cyclin D-dependent kinases, whereas Cip/Kip proteins specifically inhibit cyclin E-cdk2 and cyclin A-cdk2. Cyclin Ds are upregulated in response to Ras-Map kinase signalling and assembled with cyclin D-dependent kinases (CDKs). 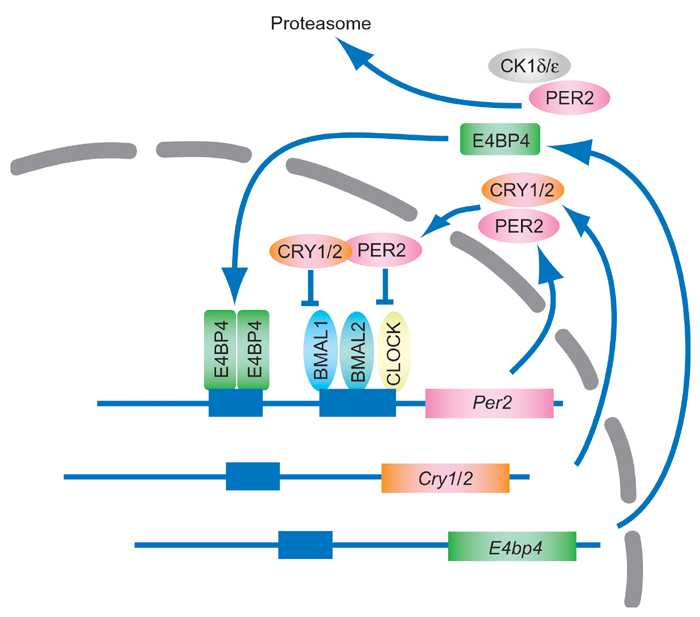 The CDKs initiate Rb phosphorylation, releasing E2F from negative constraints and facilitating activation of a series of E2F-responsive genes, the products of which are necessary for S-phase entry. Activation of cyclin E by E2F enables formation of the cyclin E-cdk2 complex. This is accelerated by the continued sequestration of Cip/Kip proteins into complexes with assembling cyclin D-cdk complexes. Cyclin E-cdk2 completes the phosphorylation of Rb, further enabling activation of E2F-responsive genes, including cyclin A. Cyclin E-Cdk2 also stimulates DNA synthesis presumably by facilitating origin firing through Cdc45-dependent loading of DNA polymerase and promoting histone biosynthesis through direct phosphorylation of NPAT, a factor required for histone transcription. Cyclin B is synthesized in the end of S phase and associated with cdc2. CyclinB/cdc2 complex is held inactive during G2 phase and become active during M phase mainly because of Thr 161 phosphorylation by CyclinH/cdc7 complex, and Thr14 and Tyr15 dephosphorylation by CDC25 phoaphatase. Alleles of human HLA class I, which are frequently observed in Japanese people, cloned into an expression vector were deposited by Dr. Yoshiki Akatsuka, Aichi Cancer Ctr. Res. Inst. The other classes of human HLA cDNA clones are also available. Comparison of MAP kinase pathways that are implicated in the control of the cell division cycle. The MAP kinase cascade is illustrated together with the main downstream substrates implicated in cell cycle control. Crosstalk may exist in vivo between human MAP3K enzymes and MAP3K components of other parallel pathways. 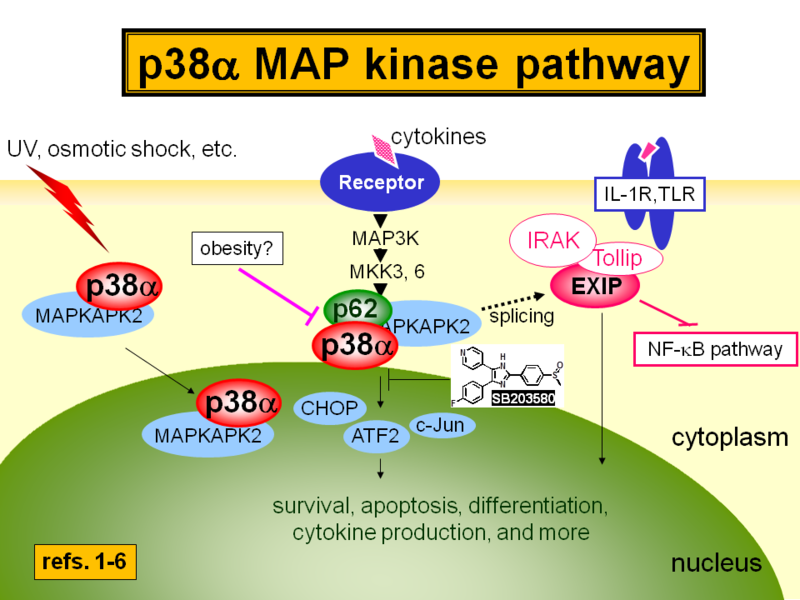 For example, MEKK3, while being implicated in the regulation of MEK5 activity, is also a potent activator of the p38 pathway. Similarly, Tak1 can activate the JNK pathway. Studies reporting the promiscuous nature of MAP3K enzymes, however, are subject to certain experimental caveats and are therefore subject to debate. Mouse, Cell and DNA Resources of p38 MAP (mitogen-activated protein) kinase were originally developed and deposited by Dr. Tatsuhiko SUDO, RIKEN. Those resources are beneficial for the researches focusing on intra- and inter-cellular stress signaling. Also they may be utilized for physiological, pathological and hereditary studies. In addition, the specific DNA clones are designed for p38α inhibitor screening method using growth recovery of bacteria as an index. Activation of the network (by stresses such as DNA damage, ultravioletlight and oncogenes) stimulates enzymatic activities that modify p53 and its negative regulator,MDM2. This results in increased levels of activated p53 protein. 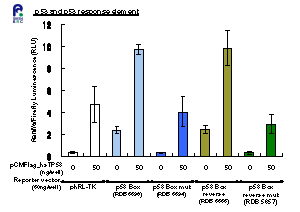 The expression of several target genes is then activated by binding of the activatedp53 to their regulatory regions. These genes are involved in processes that slow down the development of tumours. For example, some genes inhibit cell-cycle progression or the development of blood vessels to feed a growing tumour; others increase cell death (apoptosis). A negative feedback loop between MDM2 and p53 restrains this network. Many other components of this network, not shown here, havebeen identified. Similarly, p53 activation results in a variety of other effects, including the maintenance of genetic stability, induction of cellular differentiation, and production of extracellular matrix, cytoskeleton and secreted proteins. The inactivation of p53 by Mdm2 is counteracted by mechanisms involving post-translational modification of p53, or the Mdm2 inhbibitor ARF. Through its activity as a sequence-specific transcriptional activator, p53 increases the expression of pro-apoptotic Bcl-2 family proteins. Potential transcriptionindependent functions of p53 co-operate with the Bcl-2 protein to induce the release of apoptogenic factors (depicted as circles) from the mitochondrial outer membrane. Released apoptogenic factors facilitate the activation of the effector caspases through the Apaf-1-caspase 9-apoptosome. DNA damaging agents induces accumulation and stimulation of p53 protein,which activate or inhibit several gene expression. p53 activates p21,14-3-3 sigma and Gadd45 transcription. p21 binds Cyclin B/cdc2 complex to keep it inactive form. 14-3-3 sigma is a cytoplasmic protein that binds to Cyclin B/cdc2 complex to let it stay in cytoplasm, therefore Cyclin B/cdc2 can not act as an active complex. Gadd45 inhibits formation of Cyclin B/cdc2 complex. Here is a list of reporter constructs deposited by individual researchers and constructed by the Gene Engineering Division. The growth factor ligand binds to its trans-membrane receptor and activates tyrosine kinases inherent in the receptor molecule (RTPK). A series of protein-protein complexes form involving Shc, GRB-2, and SOS. Subsequent to this, GDP-Ras is converted to GTP-Ras which activates Raf, MEK and then MAP kinase. Map kinases phosphorylate a number of transcription factors including TCFs (Elk,Sap1a and Net). Lipid rafts are small lipid domains on the cell membrane and are thought to play an important role in signal transduction, endocytosis and more. Because of the lack of appropriate probes to label sphingomyelin and cholesterol individually, detailed analysis of lipid rafts was difficult. Dr. Toshihide Kobayashi and his colleagues of the former Lipid Biology Laboratory at RIKEN have developed methods to visualize the lipid rafts using probes of lipid binding proteins fused with fluorescent proteins.